In the light of the Communication received from the Apostolic Nunciature, I wish to inform you that His Holiness Pope Francis has appointed H. E. Most Rev. 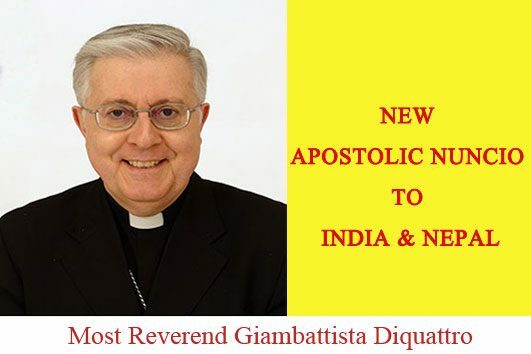 Giambattista DIQUATTRO, till now Apostolic Nuncio in Bolivia, as the new Apostolic Nuncio to India and Nepal. This ecclesiastical provision was made public in Rome on Saturday, 21st January, 2017, at noon local time, corresponding to 16:30 hours, Indian Standard Time. We thank God for the gift of Most Reverend Diquattro to the Church in India and assure him our collaboration and prayers.